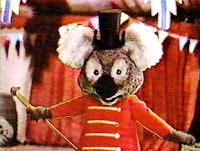 I mention Dumbo's Circus today because one of the characters has been in my head for a while now, and I've been struggling to remember his name without looking it up. I was thinking of the koala ringmaster, whose name is Fair Dinkum (the closest I got was Sir Dinkum before I looked it up). I just loved listening to his Australian accent saying things like "Ladies and Gentlemen, Dumbo's Circus proudly presents..." I also thought that "Dink" was a cute nickname... and it reminded me of another cartoon from back then: The Littles had Dinky. Anyway, I thought I'd just share who he was today in case anyone else wanted to remember him for a minute. And, of course, watch an episode. You should note, however, that because of the age of the show, it's very difficult to find decent copies of any episode, so you experience both audio and visual problems. This is also why I couldn't find a more Dink-centric episode or scene. 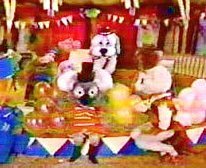 This particular episode incorporates some nursery rhymes and fairy tales, and we don't see Sebastian (the cat who does ventriloquy). The "three little pigs" segment in particular makes me laugh. Did you remember Fair Dinkum before the clip? What about after? Oh, and there are a few others on youtube (including one that is definitely better quality, but I don't like the episode as much) if you feel so inclined.